Montreal Spice Rub for sale. Buy online at Zingerman's Mail Order. Gourmet Gifts. Food Gifts. 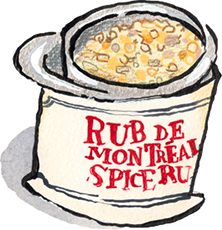 This rub made Montreal famous. At least in the deli world. The spice trekkers of Epices de Cru in Montreal based this whole grain version on the decades old recipe that put Montreal Smoked Meat on the international delicatessen map. It's the sandwich meat you'll eat when you eat deli fare in that town in the same way corned beef and pastrami are kings of deli in New York. While it was originally used on smoked meat, this blend is fantastic on grilled meats and even burgers. Made from black pepper, mustard seed, garlic, onion, salt, dill seed and chili, it adds slightly spicy flavors and a little heat to your meat. Savory and mouth-watering, it turns brisket into something great.